The Handmaid's Tale should be all we're talking about this summer. In a less divided entertainment environment — and given the political tension that dominates our waking hours — the story of a totalitarian Christian state called Gilead that takes over the former United States, resulting in the subjugation and enslavement of women as child-bearing vessels, should be the dominant metaphor of our times. But it won't be. Airing on streaming service Hulu in the States and pay cable (Bravo) in Canada, The Handmaid's Tale won't come close to reaching the critical mass required to be central to the cultural conversation. That'll probably be Avengers: Infinity War. It's not an indictment either way — merely a product of living in the era of too much TV. It's a bland, practically meaningless observation, but it's more true with every passing moment. Even the "Golden Age" (a designation of quality) or "Peak TV" (describing the deluge) — terms coined a few years ago — look quaint given the avalanche of content from streaming services and specialty outlets, not to mention mainstream channels. But while episodic, serialized storytelling is increasingly our entertainment fix of choice, the more we watch, the less we talk about it — and the less common ground we share. We're generations away from 125 million people tuning in to the M*A*S*H finale in 1983. The most talked-about show in 2018 — ugh, Roseanne — drew 15.2 million for its second episode. 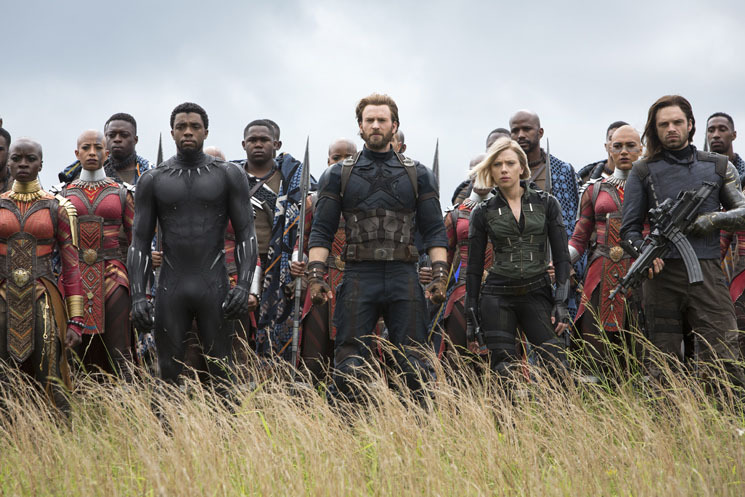 Comparatively, more people bought Avengers tickets for opening weekend than the seven previous Marvel films combined, including record-breaker Black Panther. The only realm in which television can compete is sports — Super Bowl ratings have increased significantly over the last decade compared to the 1990s — and sports-like entertainment (American Idol at its peak). The reasons are twofold: television is too much of a commitment to catch up with what everyone else is watching; and movies have stolen many of serialized TV's best moves. Casual television conversations are an in-person Google search for common ground. Love The Wire? I'll wait while you catch up on eight hours of The Deuce. Meghan Markle fans are still tearing through 108 episodes of Suits; they don't have time for the superior, Peak TV version, Billions. Even competitive reality fans don't need the common ground of Survivor when a much more niche reality competition show will serve any manner of interests, from sword forging to tattooing to accessorizing. Now, some assemblage of the Marvel gang will show up in a film or two a year, with a full team-up every third outing. Star Wars is an annual event instead of a nostalgia trip of worn-out VHS tapes. We don't need to wait three years for a Black Panther sequel in order to see our new Wakandan friends — T'Challa, Shuri and Okoye will be waiting for us in Infinity War. Is it unfair to compare this summer's comparatively meagre TV offerings with one of the most anticipated releases from the biggest film franchise in the world? Sure. There's no Game of Thrones season this year — outside of "get the popcorn and open Twitter" events like the Oscars, the most central small screen event still airing — but there was a highly touted Game of Thrones season last year, yet the most discussed, must-see event of 2017 was the directorial debut of a sketch comedian who made a horror movie. Does this summer have a Get Out? Who knows? But movies still have a much greater shot of being part of that conversation, because the next time someone tells you that you really need to catch up on four seasons of terrific period drama Halt and Catch Fire, you're likely to roll your eyes. After all, there's still Black Mirror to finish. And a new season of Jessica Jones. Ozark is coming back. I hear good things about Outlander. It's a lot.